KENTAVROS combines luxurious accommodation with a state-of-the-art streamlined design and exceptional performance. The lavish, roomy interior will provide hospitality and comfort for eight guests, in four cabins, all with ensuite bathrooms and wired for audio entertainment. 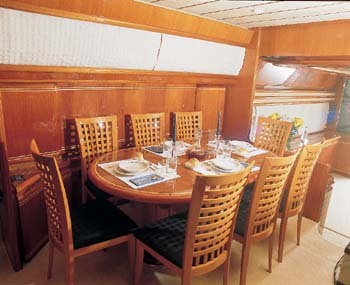 On the upper level, the dining area features a beautiful oval table for eight, from briar wood. Entertainment with all the necessary audio-visual equipment is provided in the large and luxurious salon. From there a wide sliding door and an impressive tilting glass partition will lead you to the spacious rear deck. On deck above the flying bridge, KENTAVROS provides ample space for relaxation under the blue summer sky and will prove to be an ideal spot for a light casual lunching in between swimming and sunbathing. 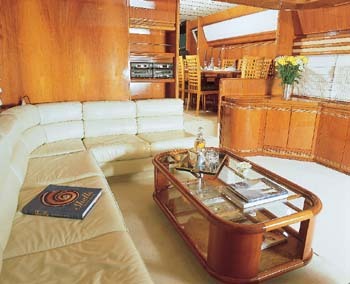 ACCOMMODATION : For 8 guests in 4 cabins. One master cabin, one VP double cabin and two twin bedded cabins. 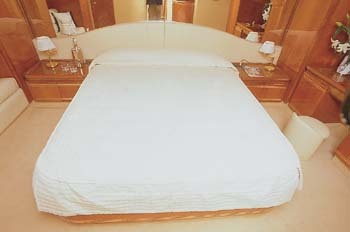 All cabins, with en suite facilities. 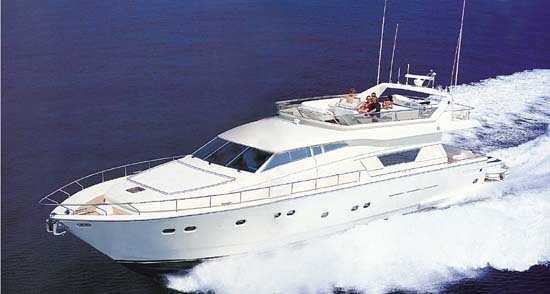 EQUIPMENT : Radar, Plotter, GPS, Autopilot, Navtex, VHF, bowthruster. , canoe, waterskiing , windsurf, kneeboard, tubes.